Today is the first chilly day, with temperatures in the unseasonable 50s. Both of my children went to school today in shorts. Judge me if you will, I used to be that mom. But no longer - I gave it up. I no longer fight with, argue with or bribe my children over coats or pants. After all, I'm not the one that will be cold. There's a saying that there are three things you can not make a child do: sleep, eat and poop. They will do them all when they are good and ready, and not a minute sooner, no matter how much you nag or plead. I add wearing coats and pants to that list as well. I can remember the days, when my boys gleeful wore what I suggested or helped them pick out. Not only were these outfits adorable, but they matched and were perfectly seasonably appropriate. Then, my oldest hit Middle School. He started pushing back. "But I don't want to wear pants!" And I would argue. I would list ALL the reasons why it made no sense that he wanted to wear shorts, and that he needed to wear pants. And he would whine and complain and fuss. On and on we would go . . .you've been there right? 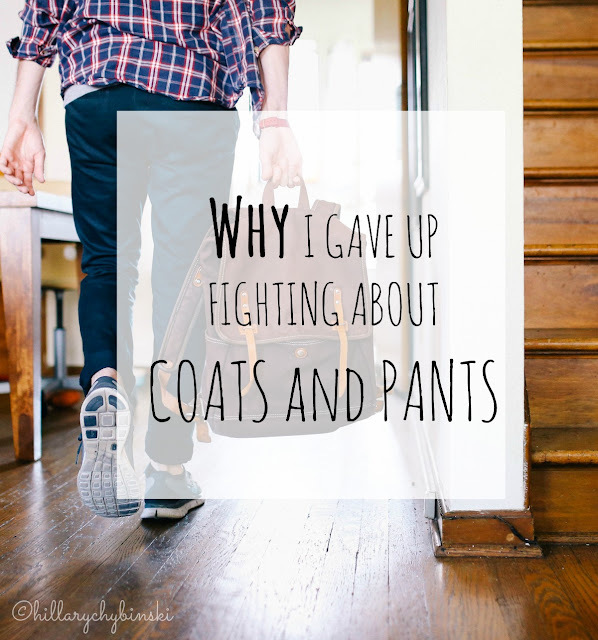 When winter came, we began having the same arguments over coats. He claimed his coat didn't fit in his locker. I had seen the Middle School lockers, based on the number of binders I had bought in September, he was probably right. He wasn't wearing a light t-shirt after all, he had on a fleece hoodie and claimed he was quite warm. He also gleefully put on a hat and gloves. Just. No. Coat. And I kept arguing for my way. I just knew I was right - it's cold and everyone should have a coat on. And then it dawned on me. . .WHY??! IS their health or safety at risk if they don't wear pants when it's 50 degrees outside or a coat when it's 40? No. Studies have shown that you do not catch a cold by being cold. If they weren't uncomfortable, why should I be? And that's what I realized - that I was the one who was uncomfortable. I didn't want other moms judging my parenting and thinking I couldn't "control" my kids or that they weren't mindful of my rules. When the temperatures dropped into the 30s, he put on a coat to walk to the bus without any arguments. When it warmed up again, I didn't comment when he left in his favorite fleece hoodie. This wasn't an issue over personal appearance and appropriate attire. That's another whole argument, and I often say, "I'm glad they're boys." So where do you stand on the coat and pants argument? Do you fight for their warmth or let them chill out? This is a constant struggle with my high school freshman. I have also taken this stance with him. I just let him wear what he wants to wear and some day he will put pants and a coat on. It's funny because my daughter has no problem putting a coat on or wearing pants when it is chilly out. The other day on that bitter cold rainy afternoon, my son got off the bus shivering and wrapping is arms around his body. I asked why he didn't have his sweatshirt on. He said I like it this way. I am not going to argue. As long as he is safe, e'll need to know when to make these choices himself.